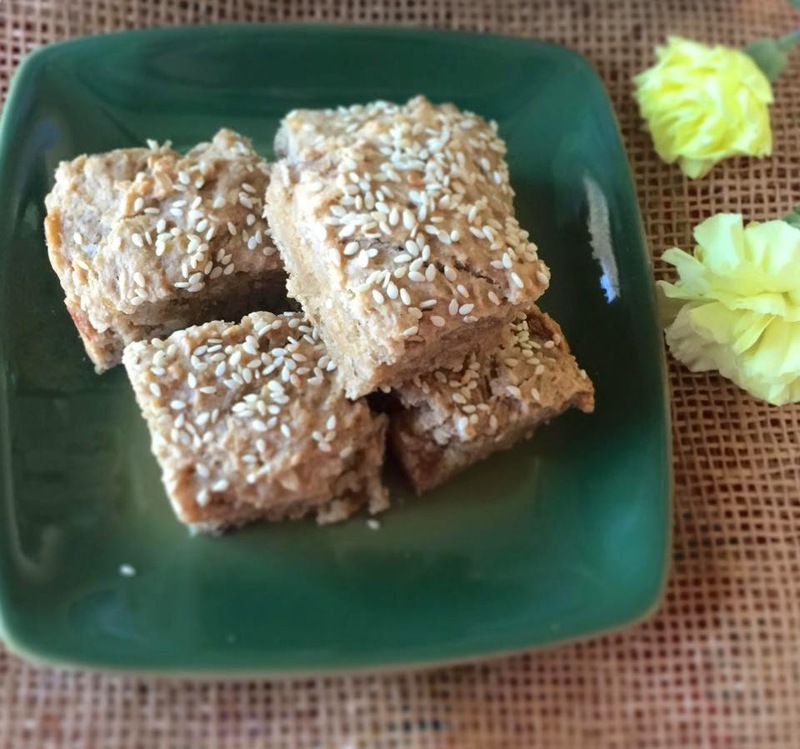 Eggless Whole Wheat Banana Oatmeal Squares and the Healthy Twist ! What do you do if you find yourself with a couple of overripe bananas but are in no mood to make plain ole banana bread? Admit it, you have already eaten it a gazillion times and by now you are craving for a different version or change altogether. Yours truly faced a similar predicament this morning when she found three overripe bananas staring at her from the fruit tray this morning. I decided to transform their pitiful existence into something beautifully edible yet different . That's where the healthy twist came in. The all purpose flour had to be replaced with nothing less than whole wheat . Wasn't in the mood for 50 -50 either. So all purpose flour exited the scene albeit with a heavy heart . Next, the oatmeal was converted into flour form by giving it a run in the blender/food processor. The original recipe which uses all purpose flour is dairy free , but yours truly took the liberty of using 1/4 cup milk as the whole wheat batter was thicker. Could have added some chia seeds but omitted them for no particular reason . white sesame seeds for sprinkling on top. Take a bowl and add the dry ingredients - whole wheat flour(sifted) , baking powder(sifted) , salt and brown sugar. Now add the wet ingredients - oil, milk, mashed bananas and vanilla extract. Mix thoroughly with the help of a spatula and transfer to the greased pan. Sprinkle the sesame seeds on top and bake for 30 minutes or until a tooth pick comes out clean. Cool on a wire rack , cut into squares and enjoy with a cup of masala tea .